This 5 minute guide explains how to prevent knee injuries while snowboarding, helpful if you want to support a previously weakened ACL and protect against further damage. When Do Snowboarding Knee Injuries Occur? ACL (anterior cruiciate ligament) injuries are among the most common sustained by snowboarders, second only to wrist fractures. Snowboarding knee injuries tend to occur when miscalculated jumps, tricks and collisions place an unnatural strain on the ligaments. Even getting off a chairlift can be enough to cause damage if you twist and put all your weight on your knees as you land. In September last year, Billy Morgan, the first snowboarder to land a triple backside rodeo (three flips in mid-air), ruptured the ACL and MCL (anterior cruciate and medial collateral ligamentsl) in his right knee during training. Billy was set to compete for Team GB at Sochi 2014, and understandably he was devastated. However, he didn’t let his snowboarding knee injuries stop him. With the right physiotherapy and support, Billy managed not only to compete in the Winter Olympics, but qualified for the finals with an incredible 90.7, eventually finishing 10th. And a couple of weeks later, France’s snowboard cross champion Pierre Vaultier won gold – having torn his ACL just two months before the games. As the above examples show, snowboarding knee injuries such as ACL tears needn’t stop you from enjoying the sport, or indeed returning to a high performance level. Neither Billy Morgan nor Pierre Vaultier had surgery. This can take up to six months, so rather than miss the games they were willing to risk further injury in order to compete. However, if you have suffered a torn ACL and wish to continue participating in high-demand physical activity, surgery is recommended. It will help you regain stability, in turn enabling a safe return to sport without the danger of another, potentially more severe injury. 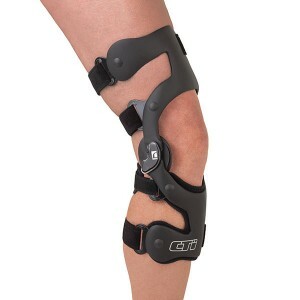 If you have already undergone surgery and/or wish to support a partially torn ligament or weak knee, a good quality ACL knee brace is the best solution. This is what enabled Billy Morgan and Pierre Vaultier to give such a fantastic performance in the games – against all odds. The best knee braces for snowboarding are those which provide rigid control and support for the entire knee, preventing unnatural movement. Fabric knee supports are not supportive enough to provide full protection against such movement, making them inadequate as a safeguard against snowboarding knee injuries. Ossur CTi – combining a rigid carbon composite frame with silicone padding and tibial straps, the CTi is both highly supportive and incredibly comfortable. DonJoy Armor FourcePoint – this is made with a light, aircraft-quality aluminium frame, steel outer plates and anti-migration padding to give incredible protection and support. Each of these knee braces for snowboarding are favoured by amateur and professional snowboarders the world over. If you would like to give one a try, Technology in Motion supplies both and can help you decide on the best ACL knee brace to suit your injury and lifestyle. We have clinics up and down the UK and are recommended by physiotherapists and orthopaedic consultants nationwide.